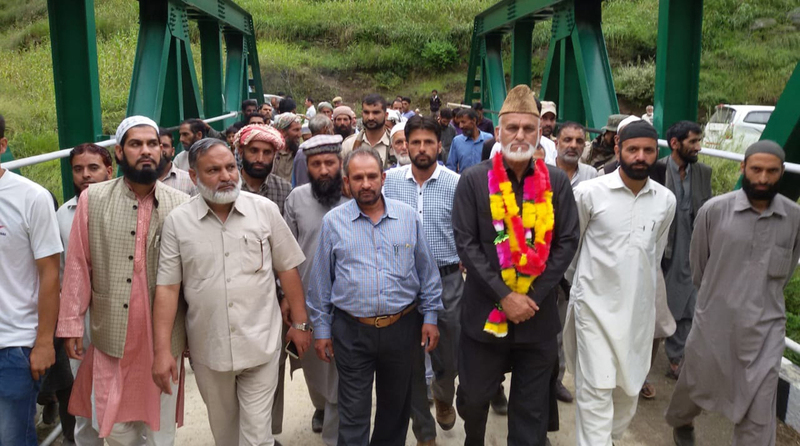 MLA GM Saroori moving along with Govt officials and locals after inauguration of a bridge in Chhatroo area of Inderwal on Tuesday. KISHTWAR, Sept 11: As a part of series of developmental work to be taken in Inderwal constituency of Kishtwar district, Congress MLA from Inderwal Ghulam Mohammad Saroori today laid foundation stone of two important road projects beside also visited Mullar and Passerkoot areas of Chatroo to inspect the various ongoing developmental projects in the area. Saroori today first inaugurated 45 meters span single lane bridge on Damber to Mullar road having length of 45 meters constructed at an estimated cost of Rs. 187 lakh. In addition, he laid the foundation stones of Rs 12.55 crores developmental works which include construction of Chatroo to Singpora road having the length of 11.50 Km under PMGSY sanctioned at an estimated cost of Rs 741.69 lakhs under Phase XI and also laid the foundation stone for construction of Passerkoot to Naidgam road having the length of 4.80 Km sanctioned at an estimated cost of Rs 325.84 lakhs also under Phase XI along with the blacktopping work of the same. The construction of these roads is expected to benefit around ten thousand people of 30 villages in the area. The MLA also announced up gradation of 7 kms Chatroo to Vohal road which include widening and blacktopping. He has also announced that on all the roads of the Inderwal constituency, the blacktopping work will be completed within two years. Saroori said that during his recent meeting with General Manager NHIDCL, he inform that the Corporation has proposed construction of 700 meters tunnel at Kuligarh to avoid landslide hit prone area which has become a death trap for the daily commuters. He said that the DPR of prestigious Singpora -Vailoo tunnel will be submitted by the month of December 2018 added that he is hopeful that the work on Singpora-Vailoo tunnel will be started in April 2019. He said that with the construction of Singpora-Vailoo tunnel, the distance between Kishtwar and Srinagar will be reduced by more than 56 Km. Executive Engineer PMGSY Chatroo, AEE and other officials officials from RDD, Education, Revenue and PHE besides local Congressmen’s were present on the occasion.